Manzanilla tea is the Spanish name for chamomile tea. It is used to treat a variety of digestive ailments, as well as to promote relaxation. Drinking Manzanilla tea is relatively safe, but you should consult with a qualified health practitioner before using it if you suffer from any type of serious health issue or are taking other medications. The Manzanilla, or chamomile, plant comes in two common varieties: Roman chamomile and German chamomile. 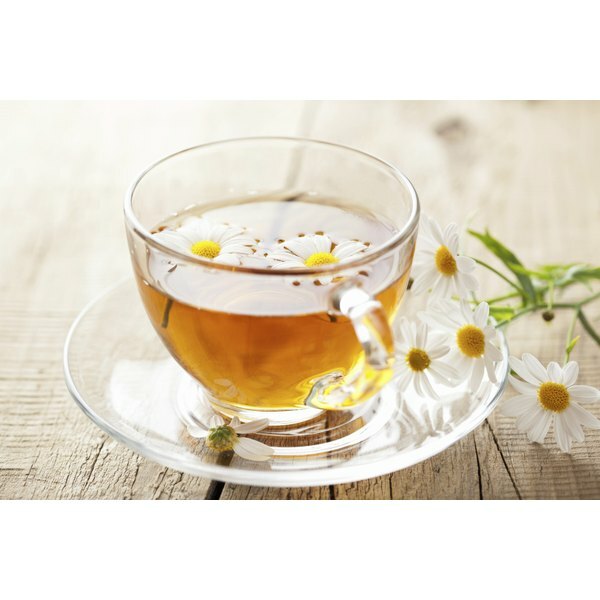 Most research has been performed on German chamomile, but they are both used for similar medicinal purposes. The chamomile plant has white flowers and is similar in appearance to a daisy, although Roman chamomile has bigger flowers than the German variety. The white flowers, and their yellow centers, are used as a medicine, most often in the form of a tea. The traditional uses for Manzanilla tea are similar throughout the world, usually based on the plant's anti-inflammatory properties -- generally attributed to the terpenoids and flavonoids present in the plant. Some comment ailments treated include digestive issues, hemorrhoids, anxiety, insomnia and skin problems, such as eczema. According to Martha Libster, author of "Delmar's Integrative Guide for Nurses," using a Manzanilla tea infusion for female issues is very common in the Hispanic culture. Commonly treated issues include menstrual problems, labor pains and, together with other herbs, cleansing after childbirth. Few studies have been performed on humans using Manzanilla tea, according to the University of Maryland Medical Center, but studies on animals have validated some of its traditional uses. Those include inflammation, speeding of wound healing, reducing muscle spasms and serving as a mild sedative to help induce sleep. To make Manzanilla tea, the University of Maryland Medical Center recommends pouring 1 cup of boiling water over 2 to 3 heaping tablespoons, or about 2 to 4 grams, of the flowers and steeping the infusion for 10 to 15 minutes. It is best to drink the tea between meals. Many over-the-counter brands of prepackaged Manzanilla tea are available as well. Be aware, however, that some of the premade teas contain other herbs in addition to the Manzanilla flower. Drinking the occasional cup of Manzanilla tea is considered relatively safe, according to the University of Maryland Medical Center, but if you plan to use it as a medicinal several times a day, consult your doctor first. The tea may also interact with other medications, particularly blood thinners, blood pressure medications, sedatives, diabetes drugs and several other prescription medications. Manzanilla, or chamomile, is a flower, so people with asthma or allergies to ragweed, daisies or similar plants should avoid it. If you notice any type of allergic reaction -- such as sneezing, skin rash or trouble breathing -- discontinue use and call a qualified health professional immediately. Because of the risk of miscarriage, pregnant women should not drink Manzanilla tea. Anyone with a history of breast or ovarian cancer should check with their physician before drinking the tea.